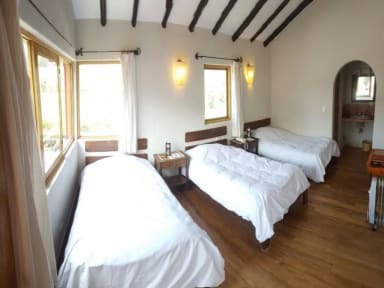 Flying Dog Hostel Urubamba offers large private rooms with private bathroom ( Double or twin beds) and comfy Dorms (4 people) with their own bathroom! Hugh common areas and green gardens to help you chill during your stay! Breakfast included, WiFi, our restaurant and a Bar! We can help you with tourist information or more adventurous activities as trekking, mountain biking or rafting! We are here to make your trip the best you can! Stay with us and you wont regret it! The best value for your money. Flying Dog Hostel Urubamba is Located in Urubamba, on the road that take you to Cotohuincho, right next to the train tracks. 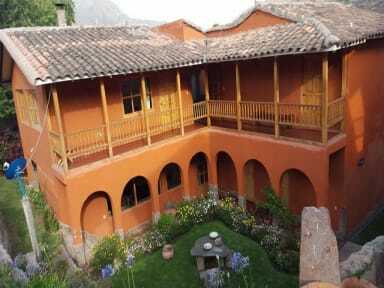 Close to the Hostel there is Urubamba center with its main square, great restaurants and churches. All the attractions of the sacred valley of the Incas are close by like Pisac, Ollantaytambo, Maras and Moray, etc. The Vilcanota river offers you the experience of rafting and other adventurous activities like a canopy or trekking around the beautiful sightseeing’s. Our rooms are very spacious and very well illuminated. Most of them have wonderful views of the mountains and riverside, and others have an interior view to our garden. All rooms have a closet and all have big private bathrooms. Comfy beds, good pillows and cleaned every day. Taxes not included - 19.00% 9for Peruvians people).